Size Choose an option1 lb.2 lbs. 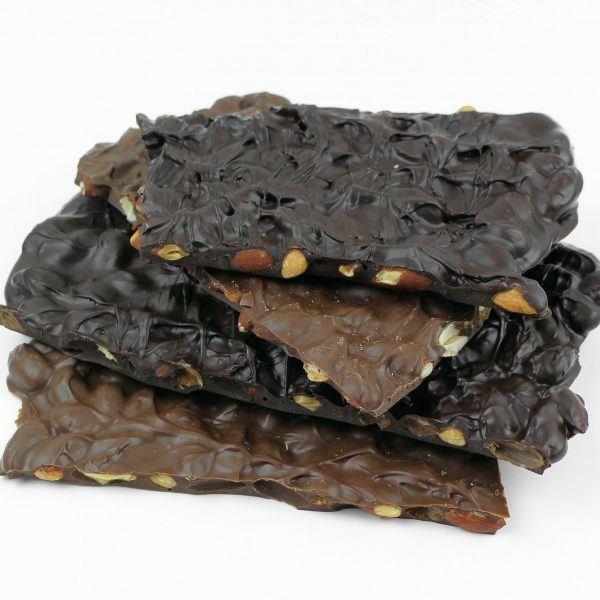 A thick slab of our rich chocolate loaded with roasted whole California almonds. Milk Ingredients: Milk Chocolate [Sugar, Milk, Cocoa Butter, Chocolate Liquor, Soy Lecithin (an emulsifier) and Vanillin (artificial flavor)], and Roasted Almonds (Almonds and Canola Oil). Dark Ingredients: Dark Chocolate [Sugar, Chocolate Liquor (processed with alkali), Cocoa Butter, Milk Fat, Soy Lecithin (an emulsifier), Vanillin and Natural Flavors] and Roasted Almonds (Almonds and Canola Oil). May contain Wheat, Milk, Peanuts, Tree Nuts, Soybeans and/or Eggs.